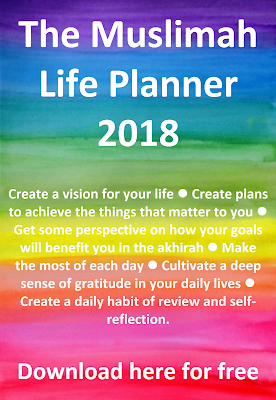 I created the Muslimah Life Planner 2018 by taking the best of the techniques, tools and planners and journals I have used over the years to try and manage my life better. I have built on previous versions to make this the biggest and best version yet insha’Allah. Pages to look back at the end of 2018 and reflect on achievements and lessons learned. I am sharing it the hope that Sisters find it beneficial in helping to set wonderful goals and feeling inspired to achieve them. I hope it gets Muslimah’s thinking about how 2018 could be an amazing year for them full of clarity of purpose, gratefulness and creativity insha’Allah. This planner will help you to work through listening to your inner voice (Vision Board exercise pages), deciding what the most important things are for you in the greater scheme of things (Life Planning pages) and then focussing on the parts that you can realistically do over the coming year (Daily Pages for 2018). The Daily Pages will give you lots of space to dream, explore, plan and review how you will make these things happen. The act of setting them down on paper will mean that rather than vague ideas they are laid out in black and white where they can be prioritised at the start of your day, included with your days work and reviewed at the end of your day. I hope the journal also offers a safe space for introspection and for reviewing ourselves each day in order to learn and improve. I also hope it helps Sisters to find something in every day to be grateful about and to help cultivate a deep sense of gratitude in their everyday lives. Please do download and print, you can keep the journal in a ring binder folder. I have tried to keep the formats simple so that they are print friendly. There are some parts where you may need more than one copy of a page because you have lots of goals to plan out or because your vision is so expansive alhamdulillah. Simply print the extra pages and slot in where you want. This format is also conducive to adding in drawings, cuttings, art work, collages and articles you might want to save to inspire you. Good intentions count for so much in Islam and planning ahead to maximise our good deeds is the first step in making those intentions. After finding myself overwhelmed with everything I had to do with five children, a busy household and work, in the end it was using a daily planner that helped me to start managing my time better and understanding where my time stealers were. If you find it useful, please make dua for me and my family. If you find the Journal useful or have suggestions for improvement I would love to hear from you at umm_salihah@yahoo.co.uk or in the comments and perhaps I could incorporate some of them into an updated version for next year. thank you so much for your hard work and inspiration. I pray Allah will reward you and your family for all the work you have put into this planner.